War Department Austerity 2-8-0 Locomotive No. 90733 built January 1945 and Matchless G3L 350cc Clubman built 1949. Worth Valley Railway 5th June 2010. 06 Jun 2010 nice picture, nice bike! 06 Jun 2010 how good would this picture look on next years calender? 07 Jun 2010 If we get a calender next year!! I do hope so! 07 Jun 2010 Great Pic, and yes a good calender pic too. Movement, atmosphere, timeless. Spot on! 07 Jun 2010 Thanks for the comments chaps. 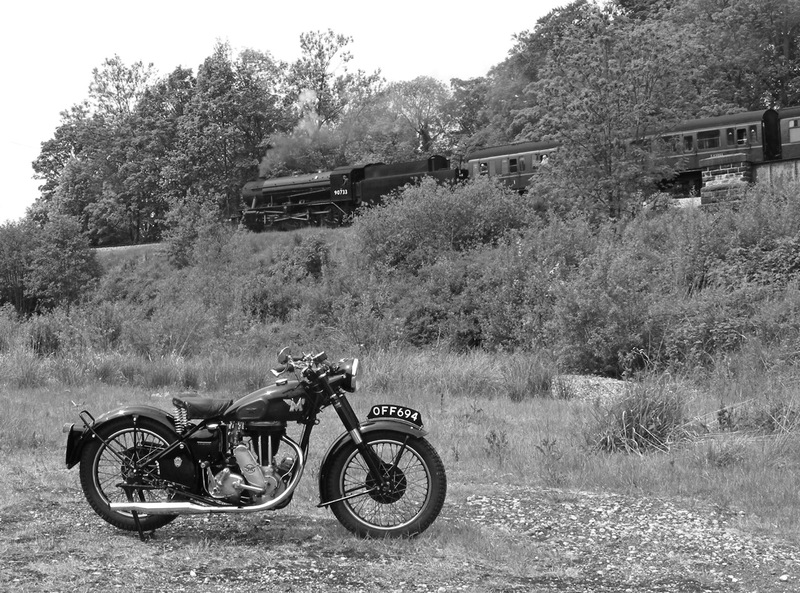 I enjoy photographing the motorcycle in typical ’Period’ situations, hopefully more to follow. 09 Jun 2010 will be using this picture as my wall paper on computer. Fab photo. 09 Jun 2010 Brilliant pic, one of the best I have seen on this site, bike in sharp forground focus, is it copyright? would like to print in A3 to frame and hang on wall of den.